POE-S104T, 4 Port PoE Switch, it reduces lots of cost of equipment and installation by delivering data and power over existing Ethernet cables. 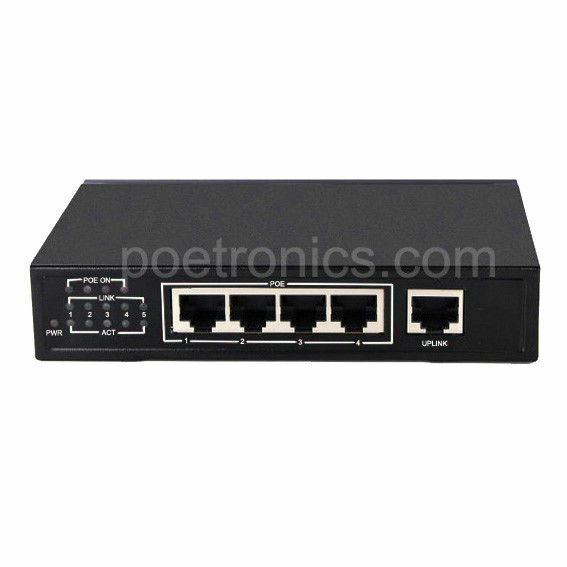 This 4 ports unmanaged POE Switch come with 100Mbits PoE interface which supply 30 watts power each port for connected devices such as IP Network CCTV Cameras, Wireless Access Points and VoIP Phone, etc. There also has two fixed links and four screws to mounted the Power Switch on rack. Auto sensing technology delivers 30 watts to 802.3at standard PoE supported devices. It also improves office work efficiency and reduce workshop network congestion with a 1 Gbps switching capacity. There are LED lights indicates the connected device status which will highly improve the troubleshooting efficiency. Finally, this 4 Port PoE Switch is fitted in a solid metal enclosure. Interface: 4 100M bit Auto-MDIX PoE / PoE+ RJ-45 ports. Data Transfer Rate: 10/100 Mbps (Half / Full Duplex, Ethernet). Forwarding Rate: 10 Mbps/14,880 pps; 100 Mbps/148,800 pps. Data RAM Buffer: 96 K bytes. Address Table: 2 K MAC entries.